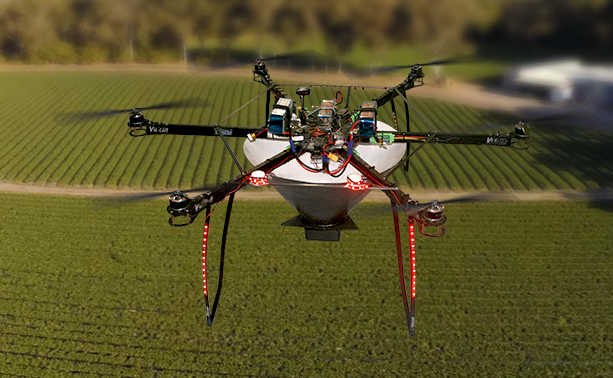 The brainchild of Nathan Roy, Aerobugs is a commercial UAV operation licensed by Australia’s Civil Aviation Safety Authority (CASA) to distribute preferential insects from the air over a variety of crops. These bugs, through their natural life cycle, kill pests that can destroy a number of crops including strawberry, tomato, brussel sprouts, pears and more. The use of preferential insects to kill pests in crop production has been used for decades and is constantly being researched by Australia’s CSIRO. Normally insects are distributed by hand, either by walking or from a quad bike. This practice is slow and labour intensive, especially when considering tens of hectares or larger. Starting out his business life as a 3rd generation strawberry famer, Nathan made the switch to UAV’s after losing 700 tons of strawberry crop to rain and weather damage. With the extended family switching to turf farming, Nathan decided to explore his interest in UAV’s to see if he could forge a business from his hobby. Ordering his first UAV frame from eBay while sitting in the cab of his tractor, Nathan wondered if the spreading of preferential insects, a job normally done by hand on his farm, could be better managed from a suitably designed and built UAV. A true family business start-up, it was not long before Nathan’s wife, Amanda’s kitchen was full of UAV frames, motors and speed controllers. In fact, Amanda quickly picked up the job of designing and making the bag that would hold the insects and allow for a smooth distribution flow. Amanda produced seven or eight iterations of the design before settling on a design that seemed to work best for the initial commercial applications. Meanwhile Nathan got busy on designing his now patented spreader. Mounted at the bottom of the bag the spreader produces an even distribution with very low insect mortality rates. The prop wash from Nathans home built, eight propeller UAV helps to make sure the insects penetrate deep into the crop foliage. It was not all fun and playing with toys. Nathan had to negotiate the brand new playground of aviation regulation. Working closely with CASA to make sure he himself met all the requirements of a UAV commercial pilot, he then had to convince them that dropping insects from the sky was a perfectly acceptable use of UAV technology. It took some support from the Bio Security division of Australia’s Department of Agriculture and Water Resources to help CASA understand what Nathan was doing. It was a two-year process to secure all the needed paperwork but then Nathan was something of a pioneer, and he remains one of CASA’s only UAV operations regulated to perform such tasks. Nathan received a shock when CASA sent seven personnel to his flight test to receive his commercial UAV licence. It turned out however they just wanted as many CASA field staff to learn as much as they could to try to keep ahead of the UAV and RPA growth curve. Nathan passed with flying (pun intended) colours. With hundreds of hours of testing and 12 months of application on a tomato farm with resounding success, Nathan began to grow his commercial preferential insects’ application business. Aerobugs sources the preferential insects from Bugs for Bugs Pty Ltd based in Mundubbera, QLD. They have worked closely with Nathan from the start, and their field scouts conduct post application inspections to check the quality of the spread, mortality rates and to capture vital data, not only for cross checking with Nathan but for their own business and data analysis also. The insects are mixed with a vermiculite medium so they have something to cling to, and so they fall cleanly below the UAV. Nathan has determined that a sweet spot of about 5 metres of altitude works best for an even distribution and so any breeze will not move the bugs too far from the UAV. Like any aerial application technique, Nathan uses the wind to his advantage as long as it is not too strong and positions the UAV accordingly as he manoeuvres along the rows. Common pests include the Red Spider Mite or Two Spotted Mite and can affect hundreds of vegetable and food crops. A common insect that Aerobugs distributes to counteract these is the Preditor Mite (Phytoseiulus Persimillis) as they break the life cycle. Trichogramma wasps are also used to protect tomato crops. Every job requires two people on site to manage the flight and keep the area safe. Even though the area is marked with signs stating there are low-level aerial operations in progress, people still love to walk across a paddock or up a dirt road to look at what s going on. At this point, the UAV is returned to the operator and parked in hover until the offending onlookers are clear of the area. Australia wide Nathan has six cross-trained pilots who can operate as observers or pilots when he needs them. All flying is done manually for now as the autopilot software available for many UAVs is not quick enough at correcting for sudden wind gusts and altitude changes. Through plenty of experimentation, Nathan finds hand flying to be the most reliable for now. Nathan builds the UAV’s himself and there are six in the fleet. There have been many iterations along the way to perfect flight times with payload and reliability. These are not your average weekend hobby machines. They are expected to operate for hours a day over several days to keep up with demand. Flight times per battery charge average about 18 minutes. Many of the required items are sourced from Foxtech. Nathan has tried many motors but has settled on the Foxtech 380KV motors as they provide hundreds of hours of reliability. Apart from the odd bearing change, his motors see over 450 hours regularly. Frames, props and his Foxtech 145G remote control are also sourced from Foxtech. The US Pixhawk with Mission Planner does flight control duties and the motor speed controllers come from Hobbywing. The Aerobugs UAV’s are agriculture machines built to be strong, reliable and maintainable. The CASA environment at the time Nathan was putting all this together was still trying to grasp the realities of the speed of innovation. However, they have been very supportive in all respects even if it did take a few phone calls and meetings to work through all the issues. With the help of RPV Australia, Nathan received his qualifications. Having to sit the Basic Aeronautical Knowledge (BAK) test, which discussed, amongst other things how to deal with carburettor icing in piston-powered aircraft was something of a curiosity, but Nathan persevered. Nathan is not the only one who thinks CASA can make some changes there. Keeping the Aerobugs’ operations manual up to date with new designs and refining systems and processes for each type of crop operation keep Nathan and Amanda busy in between jobs. However, it has been worth it. Aerobugs is leading the way in the application of preferential insects but is also paving the way for many other types of application processes in cropping.